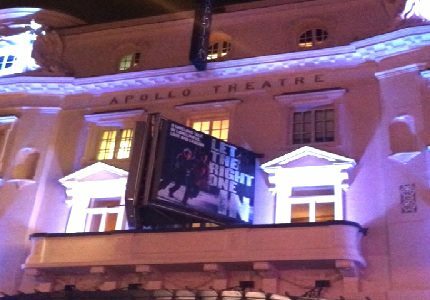 Transferring to the Apollo after a sell-out run at the Royal Court Theatre, John Ajvide Lindqvist’s Let The Right One In brings a chilling tale of horror and romance to the West End stage. 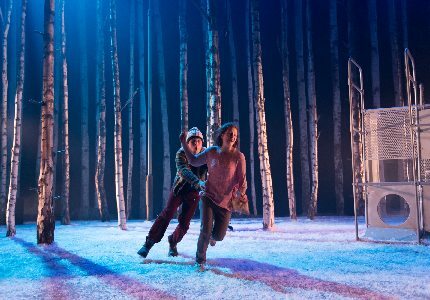 Like the novel and film from which the show is adapted, Let The Right One In is the tale of bullied schoolboy, Oskar, who struggles to deal with his life as a son of a broken home. Oskar’s lonely days draw to a close as he is befriended by an old vampire, stuck in the body of a young girl, Eli. Sensing things are amiss with his new friend, Oskar is frightened but enticed by the girl, who never seems to venture out in sunlight. Their relationship blossoms as more and more grizzly murders are reported in the nearby area. Can Oskar accept Eli for who she is? More importantly, is Oskar safe in the company of a vampire? 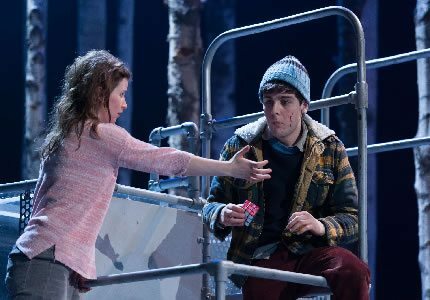 Let The Right One In stars original cast members Martin Quinn as Oskar and Rebecca Benson as Eli, who are reprising their roles from the Royal Court. 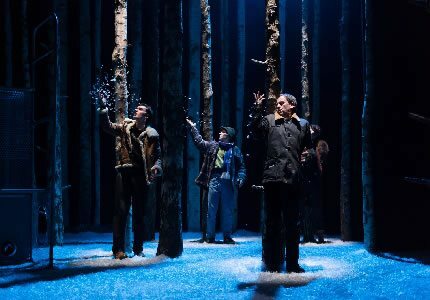 The show is adapted by Jack Thorne and directed by the highly esteemed John Tiffany. Other cast members include Graeme Dalling, Angus Miller, Cristian Ortega and Susan Vidler. This show is certainly not for the faint hearted; it contains gory scenes in a chilling setting. However the show also has tenderness and raw emotion. This spine tingling show opened at the Apollo on the 26th March 2014 with press night on the 7th April. This show is dark and somewhat twisted with scenes of gore. Let The Right One In is therefore not suitable for young children. Brave teenagers 13+ are welcome to attend the show with an adult.